Owning a living thing is a responsibility not to be taken lightly. Complete and thorough due diligence towards educating yourself regarding exceptional and proper ownership is your responsibility BEFORE contacting any breeder. You have all the resources you need at this site or on the internet to accomplish this task. We realize that some of you simply feel better "talking" to someone, but we've found we are much better able to get back into contact with you through e-mail. This way you will also have a written account of questions and answers that you may refer to rather than trying to remember what was said. The journey to exotic animal ownership can be an overwhelming process and having a written account of our discussion is invaluable. We do not wish to look unapproachable or uninterested in you as prospective parents, but with many animals to care for in our jungle, and providing customer support to our current clients, there is simply not enough time in the day to answer or repeat answers to individual questions each day, especially when they can easily be found on this site or by simple internet research. Asking for a price quote will not be answered. Asking for an answer to a question that can be found on this site will not be answered. If we are corresponding already, please keep all e-mails and try not to repeat questions. If you have not completed the REQUIRED interview below to our satisfaction you will not receive a response. Please be considerate, detailed and thorough. 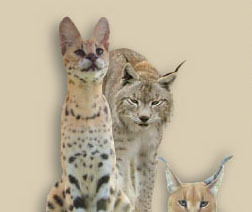 You are charged with proving to us you will make an excellent, responsible and educated owner to one of our exotics. Why is this neccessary? The facts are that based on statistics, most people that attempt to aquire an exotic animal are simply uninformed or unprepared to own these special animals. We love and protect our animals and want to do everything in our power to make sure they are aquired legally and end up in a home well suited for their individual requirements. what regulations and laws govern your state, county, zoning, parish or municipality. What is your knowledge of this species of animal? Name a few good and bad characteristics of this exotic. How will your exotic be housed? What will your exotic be fed (both as a youngster and as an adult)? Do you have children under the age of 6 or plan to have any? Are you in your permanent residence? If a permit is required please attach a copy. If you have not got your permit yet, please wait to inquire about an animal until you are legally able to do so. Any other information you would like to share that tells us you will make a fabulous human to one or more of our exotics. Note: All requested information MUST be provided, or we will not respond. E-mails only requesting prices will NOT be answered. Remember that owning an exotic animal is a privilege that if not accomplished with utter excellence, will be taken away from us by animal rights activists. Again, thank you for your effort towards this end.